You guys know me. I love neutrals. In fact, that’s pretty much all I wear! Yes, I have some colorful items in my closet, but as far as my everyday style goes it’s classics and neutrals all day err’ day. 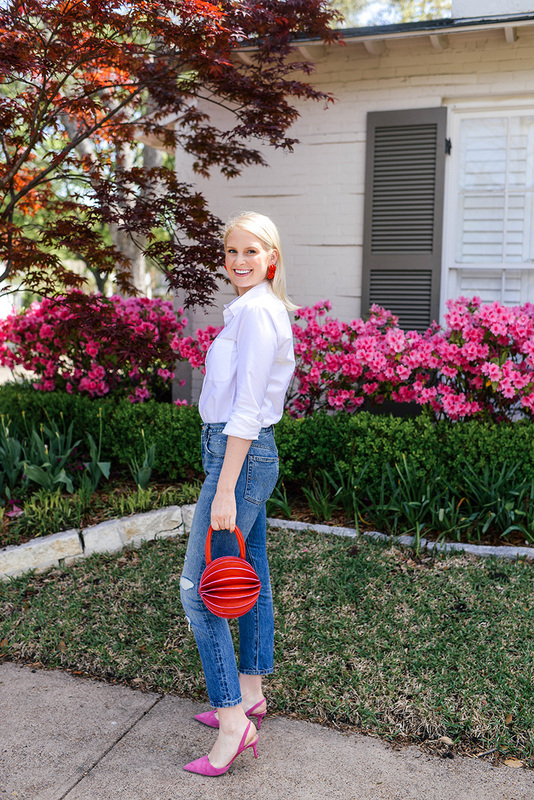 At the beginning of spring, however, I decided to invest in a couple of accessories that would add a decent dose of color to my neutral looks. With pink being the big color trend of the year, that’s what I had my heart set on. I hadn’t found anything online I loved yet, but in Argentina my sister spotted this bag in the window of a store we walked by. 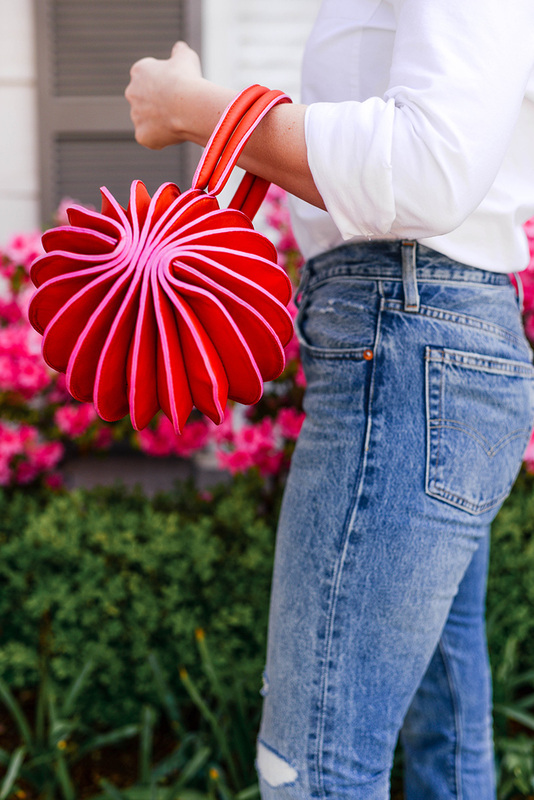 Y’all know how much I love a good handbag shape! And the colors were right in line with what I was looking for. This hot pink tote is definitely a daytime statement piece. So freaking fab! These suede mules look super comfortable and like a chic way to add color to your work or weekend wardrobe. Also love this satin style! Y’all know I love a good circle bag! This one is under $50. Wear this wallet-on-a-chain as a crossbody for travel or use as a clutch for date night! Get the Balenciaga look with these under $70 slingback pumps. Heading somewhere warm? Don’t miss this pom pom straw piece. These under $80 heels look comfortable, cute and the ideal shade of pink for spring/summer. That Delpozo bow love is real. These suede heeled sandals are at a comfortable heel height and perfect for weddings or parties this summer! 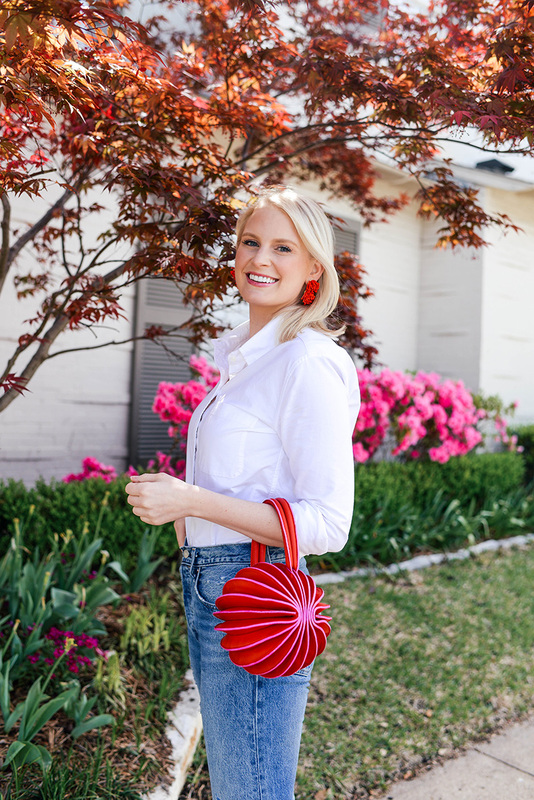 If you love the pink and red color scheme of my bag, check out this style. These J.Crew slide sandals have a cute bow accent and are a gorgeous daytime shoe. Looking for a pink tote under $50? Try this scalloped piece. Check out these double-band sandals for an effortless summer shoe. PS – thank you to everyone who read this post over the weekend and reached out with comments, emails, texts, DM’s and calls. It was a difficult post to write, but I’m so glad I did it. The response I received from it was overwhelming. When you experience grief first-hand it can feel so lonely, but publishing this post and hearing from all of you opened my eyes to how many of my readers have gone through similar experiences. It’s nice to know I’m not alone in my grief. I hope my post was able to bring some comfort to those of you currently grieving, or at least that understanding that you are also not alone. Thank you again for following along and being such caring, supportive readers and followers! It’s like having a second family, truly. Love all the fun accessories. What a fun bag!! And I didn’t get a chance to comment, but your post about your dad made me tear up. Thank you for opening up. 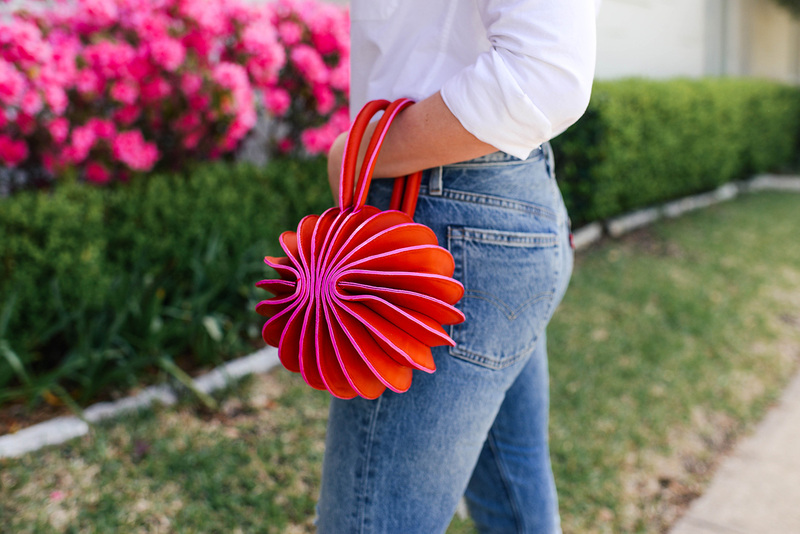 That bag is such a fun pop of color! Omg this bag is everything! I love the whole look! One of my favorite ever looks on you! I love the bold brights – especially that fun bag! Happy Monday, Merritt! This bag is so fun! I sent you a reader question a few days ago. I just recently purchased my first Chanel bag (I still can’t believe I can type that sentence). I purchased a beige bag, and the guy told me to be careful about wearing dark clothing so it doesn’t transfer onto the bag. Have you ever experienced any issues with this? Or any advice for me? Thanks!!! what a fun purse! super cute! Ohhh so cute purse and awesome hi heel..